Your beachside retreat ~~ Welcome to ''Casa Contenta''! 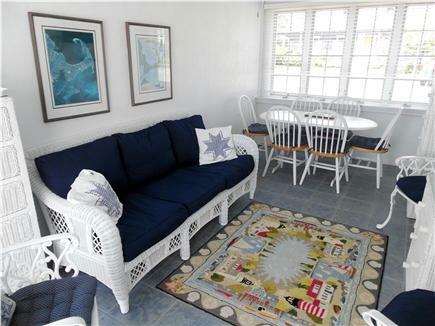 Feel the refreshing ocean air on the screened-in breezeway. 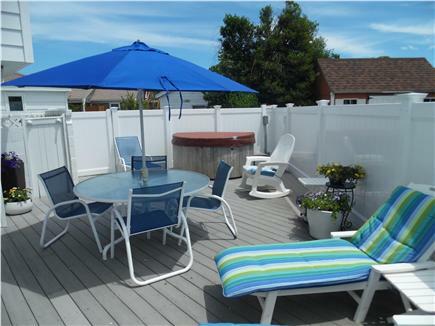 Sunbathe on the wonderful, private, outdoor deck with hot tub. Your own beach for water sports, relaxing and fun in the sun. What a gorgeous get-away! 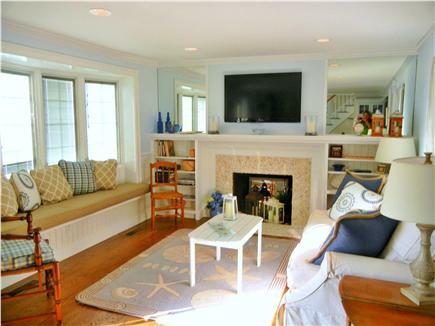 By the water in historic Barnstable Village, our newly remodelled, 5-bedroom family home offers the natural, un-spoiled beauty of Cape Cod with all of the comforts of home. No need to drive to the beach! 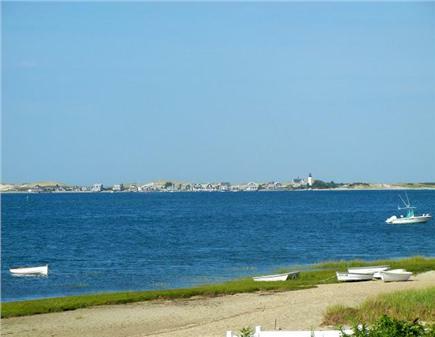 Right across the quiet street is beautiful, sandy Millway Beach, overlooking Barnstable Harbor and Sandy Neck Lighthouse. 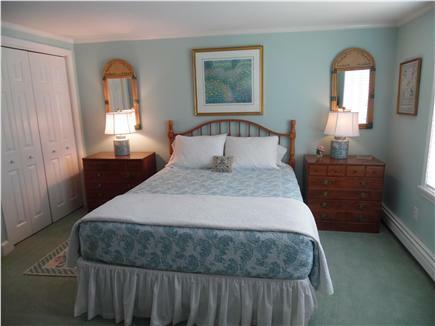 Featuring views of the water from the upstairs rooms, the house feels like a beachside Bed & Breakfast, with bright, sunny decor, comfortable new beds, high quality linens, sparkling new custom kitchen, and central AC. The 5 bedrooms include a convenient downstairs bedroom with adjoining full bath, 3 more bedrooms with queen-size beds, and a spacious upstairs bunk room doubling as a separate kids' play area. 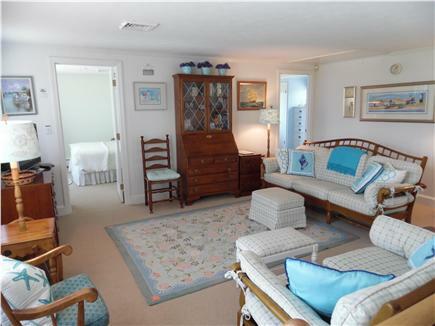 Your family will enjoy the home's 3 indoor common areas to gather and relax together: a new downstairs living/dining area, a great screened-in breezeway, and an upstairs family room with TV and view of the bay. On a beach you will never forget! Just steps from our front door, is private Millway Beach. 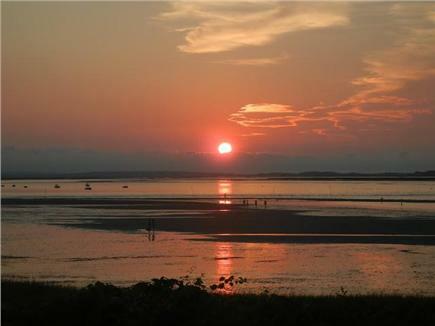 This is a spectacular, pristine tidal beach on a wonderful protected bay -- your own bit of heaven! Perfect for children and adults alike. Swim in the clean salt water at high or low tide. 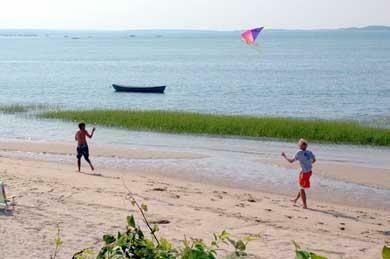 Fly a kite, build a sandcastle, or walk the magnificent stretch of tidal flats and search for sea shells as the tide receeds. In the evenings, kick back, put up your feet, and watch the breathtaking sunsets over the water. The house is well laid out with 5 bedrooms to accomodate a group. There are 4 bedrooms and two brand new bathrooms upstairs. There is a fifth, newly appointed bedroom downstairs, conveniently located on the ground level, with its own new, full bathroom. We have plenty of beach towels, chairs and toys, and a fully equipped, new kitchen with custom white cabinetry and granite countertops. The house is perfect for a family, or for 2 or 3 couples traveling together. Everything you need -- in a gracious, comfortable setting. You might want to bring your sneakers and bikes - the neighborhood has quiet little streets that are flat and perfect for walking or bike riding. We have left two bikes for you to use and enjoy. And there's lots more fun nearby -- sports, adventures, dining & shopping! 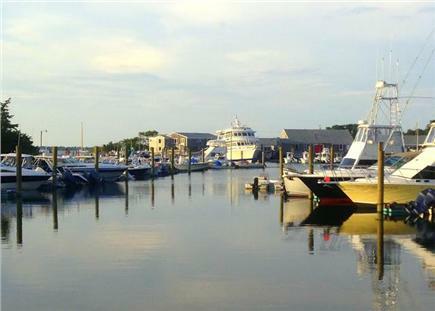 Take a 5-minute stroll over to the Marina to watch the boats and fishermen coming into the harbor. Or book an excursion of your own on the famous Whale Watch or with one of the many sport fishing boats. 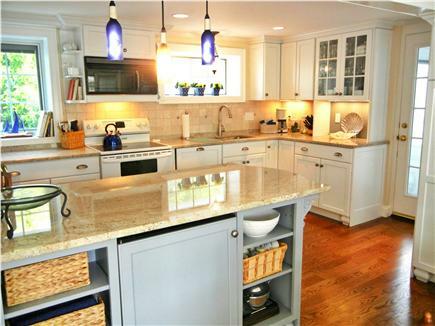 An easy 10-minute walk takes you to the historic Barnstable Village center on lovely Rt. 6-A with its many antique shops, art galleries, restaurants and ice cream shops. Delicious seafood, mini golf, public tennis and golf are all nearby too. We love our ''Casa Contenta'' in this quiet corner of the Cape, and we invite you to come make some memories of your own here. Additional pricing info: To reserve or to ask questions, please email Prudence. State and local taxes of 14.45% will apply. 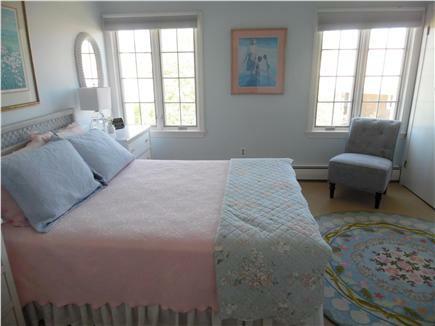 First floor bedroom, with accompanying first floor full bath and laundry. 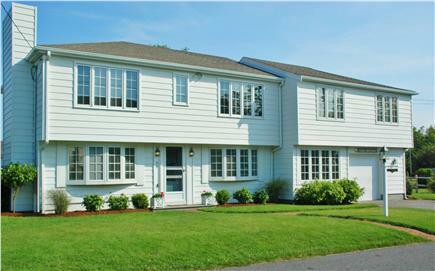 The house location feels like a real "get-away," but is convenient to Hyannis and anything you might need. 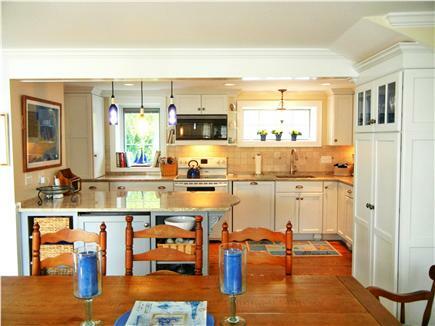 Excellent stay at this beautiful home steps from a gorgeous private beach! 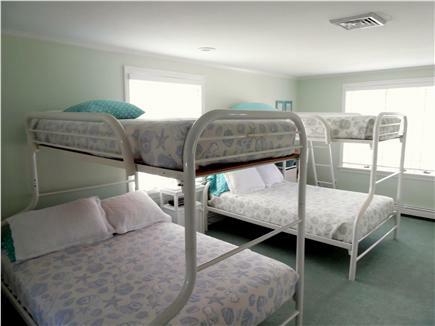 Our teenagers were in heaven with the upstairs set up (bunks and hang out space ) . Easy walk to town for shops. Whale watching boat leaves from nearby dock. Ice cream and food shack was a favorite. Well stocked house makes the stay very easy. We needed something replaced midweek and Prudence (owner) made it happen in a matter of minutes. Would return again in a heartbeat. My family stayed here for a week in August of 2008. We had a great time, and I was so impressed with the house and the wonderful upkeep the family had put into it. The difference was this is obviously a family summer home with lots of care and a family that does use it. Our family can truly appreciate that! It was great walking distance to grab a lobster roll and a dinner. The kids loved watching the boats come into the harbor!